Pitch trim on my simulator is achieved using the Simkits trim wheel, this device, like most of Simkits products, is rather expensive for what it is, cost almost €400. 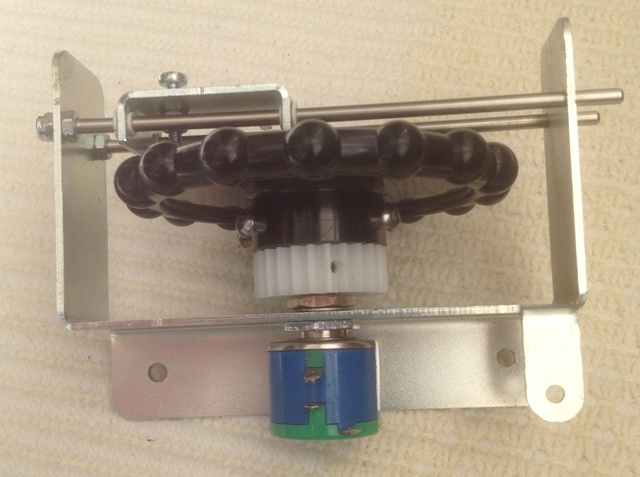 The unit basically is an aluminium frame, a 5 turn precision potentiometer, a plastic moulded trim wheel and a mechanical position indicator, which tracks a helical groove in the trim wheel. When the Autopilot is activated the aircraft pitch trim is controlled via the Autopilot rather than the potentiometer. The ‘on-screen’ trim control can be seen to move as the Autopilot controls the aircraft’s pitch attitude, but the Simkits trim wheel remains at its last fixed position, as there is no feedback capability within the hardware. This causes an issue when the Autopilot is disengaged, as the trim setting will alter immediately to the current potentiometer value as set by the position of the mechanical trim wheel. ‘on-screen’ trim wheel when the Autopilot is engaged. 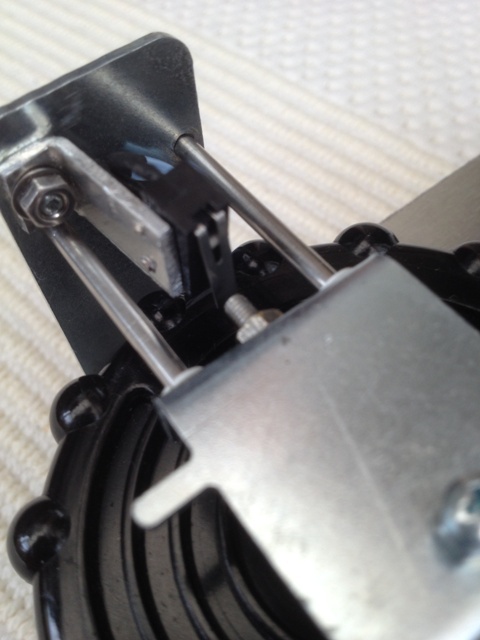 Simkits sell a motorised version of their trim wheel, which is USB connected, at a cost of €439. 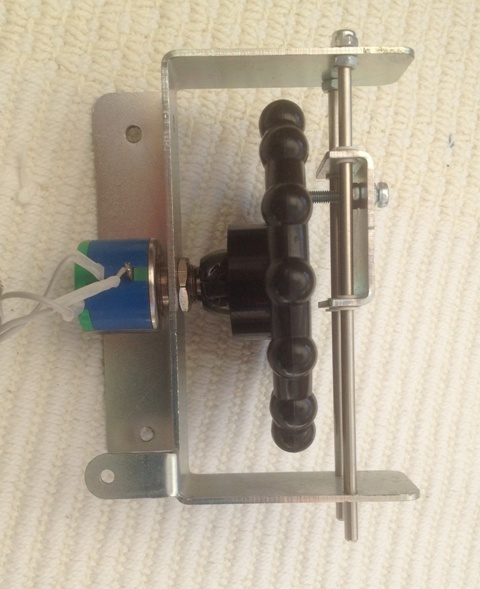 The initial approach taken was to investigate driving the trim wheel with a stepper motor and to determine the absolute position by reading the resistance of the existing potentiometer. This approach was discarded as there was too much gear 'chatter' and a toothed drive belt and pullys were substitued. 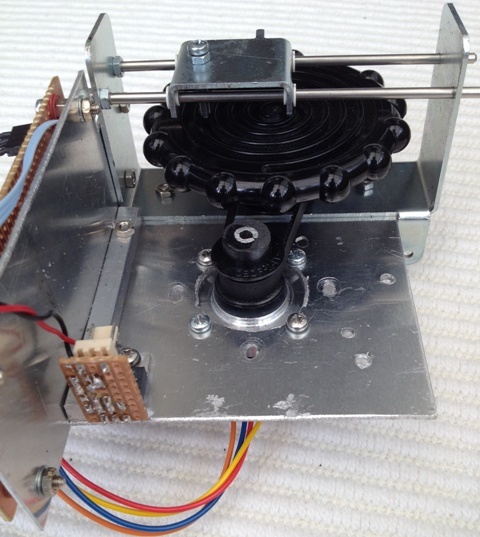 Additional alluminium brackets were used to mount the stepper motor and the electronics. 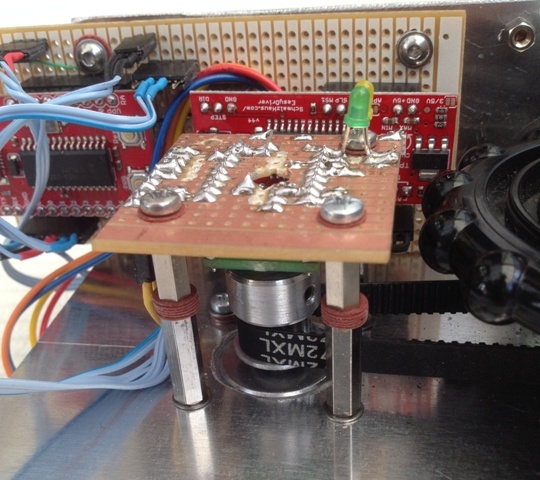 A PIC 18F2553 UBW controller board and 'EasyDriver' stepper motor controller board were used to read the position value via the existing potentiometer and to drive the stepper motor. This configuration was developed to an operation state, but although it functioned correctly, it was found that the trim wheel 'chattered' due to the potentimeter not providing the precision required. 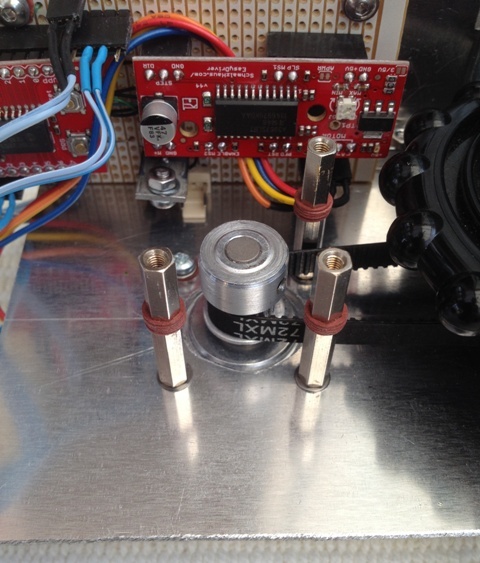 It was decided to try to improve the precision by replacing the potentiometer with a rotary encoder. 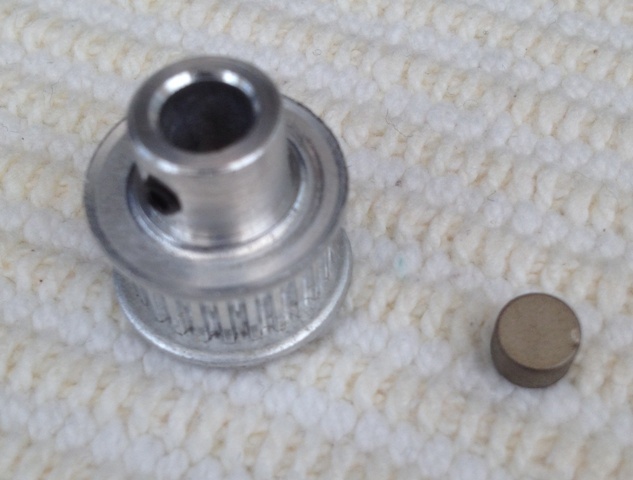 A AS5040 Magnetic Rotary Encoder was used to replace the potentiometer. 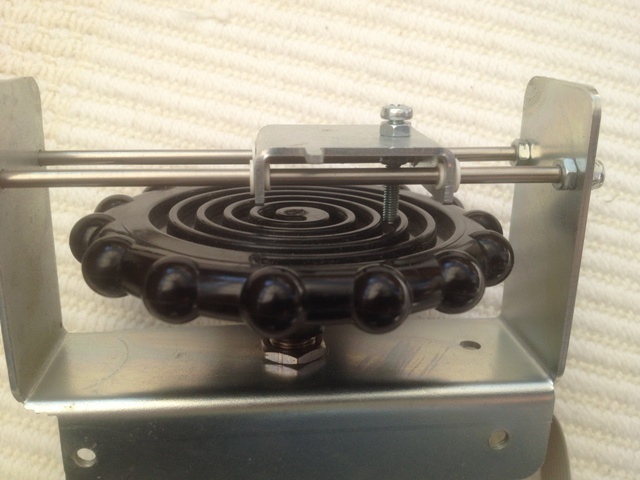 This device is used inconjunction with a small magnet to determine the rotary position of the stepper motor. A micro-switch was added to detect the lower limit of travel of the trim wheel indicator. 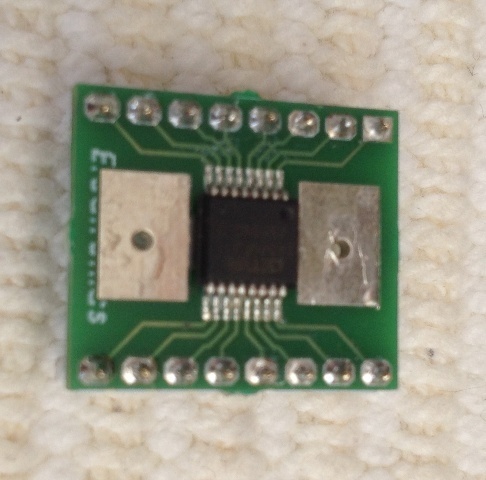 This was then used to set the zero position of the magnetic rotary encoder.